These are typically set for 15 minute time slots, although some practices might have quick ‘acute’ clinics that are for one problem only and may be shorter. Try to arrive on time and please be aware your appointment is only 15 minutes long. If you need more time, please book a double appointment. If you have an urgent issue, please tell the receptionist – they will often be able to get you an appointment with another GP. Sometimes you have to wait a little while to get an appointment with your GP – this is usually because GPs are fully booked (and we have a GP shortage and a growing population). If you can’t see your GP on the day you want, you might be best to contact them via their patient portal, that way your GP will be able to confirm how quickly you need to make an appointment and what your options for that might be. If your GP offers a Patient Portal it can be a good idea to send them a quick message before your appointment, letting them know what you are coming in for. Should I bring a support person with me? Sometimes it’s a really good idea to bring a support person – particularly if the patient has language or memory challenges. You are welcome to bring a support person to your appointment, but if there are too many people in the room it can be difficult for the GP to really understand what the patient thinks. Please don’t be embarrassed to talk about your symptoms – your GP has seen and heard it all before, and they’re here to help you. Please tell your GP if you haven’t understood them – it’s not good for either of you if there is any confusion. 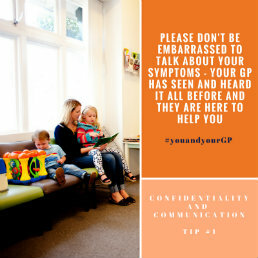 Everything you say in your consultation is confidential – so please speak freely and honestly about your symptoms. It takes time to build a relationship with your doctor – but it’s important to tell the GP what your main concern is. They can only help if you tell them what’s going on. It is important that we follow up with you on a regular basis to check how your medication is working. This is particularly important for long term prescriptions. A follow-up appointment takes as long and costs the same as an initial consultation. If your treatment or condition isn’t working, please come back to see your GP – they want to help you find a suitable solution. Don’t leave it. Not all conditions can be solved with one doctor’s visit – you may need to see your GP regularly to monitor and adjust your situation. If your GP has a patient portal, like ManageMyHealth, Health 365, Vensa or MyIndici, in place, you can book appointments, order repeat scripts and even communicate with your GP via your mobile device or website browser. This saves you and your GP time – it’s a great service – well worth registering for. If you change doctors and move to a new practice, they will request your patient notes and the notes will be transferred. If you switch doctors within the same practice, they will have access to your records, usually the cost is the same. If you have a question about payments please talk to the receptionist or practice manager – they know the options available to you. Not all conditions can be diagnosed or treated with one doctor’s visit. It can take time. If you have more than one thing to discuss, make sure you mention the most important one first. You may not have time to get through an entire list in just one appointment – but it’s important to at least talk about the most serious/concerning issue. We know most people check Google to look into their symptoms or condition. It is great that you’re being proactive. But remember, Google doesn’t have your specific details, so it’s not the complete picture. Your GP will be able to confirm whether the information you’ve found on Google applies in your situation. Your doctor won’t always prescribe medication – particularly for simple virus-related conditions like coughs or colds. Please don’t pressure your GP into providing prescriptions – not all conditions require medication. Some conditions can be managed with repeat prescriptions issued between doctor’s visits. Your GP will explain if this applies to you. GPs are trained to be respectful of their patient’s beliefs – please don’t be shy explaining these to your GP, if they are related to your physical examination or your treatment plan. Your GP wants to help you and they are trained to help you. Unfortunately most GPs are often extremely busy and sometimes their days can be pretty stressful. They appreciate your patience, if things don’t quite go to plan during your visit. Your GP wants to work with you to help solve your health issues. One of the best types of treatment plans is when the GP and the patient can work together – good communication and feedback is important. Your GP needs to weigh up many factors when considering your symptoms and treatment options. Some of their advice will rely on you making lifestyle changes. This can be challenging, but the GP can’t solve the problem without the patient been involved. Your GP looks at your whole situation and your total health picture, when considering your treatment options. They’re interested in long-term, sustainable solutions. Your GP may give you advice you don’t want to hear – but if they do, it’s with your best health in mind.